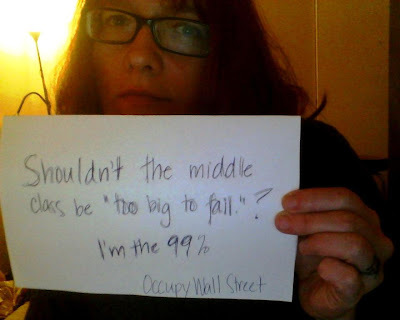 Okay, I'm sorry if it sounds rude to point this out, but the "Occupy Wall Street" and "We Are the 99 Percent" hippies are just idiots. And these idiots are getting on my last nerve. In any blog entry of reasonable length, I can only give you a tiny flavor of their idiocy. But it is out there for you to find, if you have the stomach for such things. "I don't think we're asking for much, just to wake up every morning not worrying whether we can pay the rent, or whether our next meal will be rice and beans again,"
In other words, she is unwilling to face the struggle for existence that all people in all places have had ... forever. How weak is that? You wonder, in the case of these people, if the wrong sperm won the race. Pretty much everyone has to worry about how they will eat and how they will pay the rent. Duh! But this bunch seems fixated on the wealthiest 1%, who they vilify for not having to face this struggle. 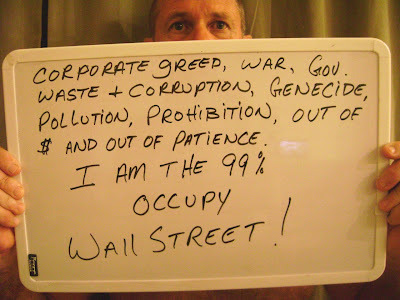 They are the 99% ... and they are moral and ethical retards. What these hippies need is a mega-dose of Dave Ramsey! Then, they would not have $75,000 in student loans or $35,000 in credit card debt. I am currently swimming in an enormous sea of credit card debt myself, but the difference is, I admit that it is my fault. My own damn fault. I was covetous. I bought things that I had not yet earned. I am paying the price that God intends for people who act in this covetous way. Funny, too, how all the people on We Are the 99 Percent accumulated their credit card debt only through medical costs, the cost of diapers, and the cost of food. Sure. I'll be they never bought any alcohol, marijuana, gaming devices, trendy clothing, or luxuries with those credit cards. Right. These folks sometimes rail against the American education system ... and perhaps with some validity because, dude, it's "genocide". Oh, and by the way, just where in the USA is this genocide occurring? The reference to prohibition is telling. I'm pretty sure that the Prohibition of alcohol was repealed last century. Let me check ... yes, it was. Presumably he is talking about the prohibition of recreational drugs. I have an idea that this is why 99% of the Wall Street Hippies are out of $$$ ... they spent it on drugs. This woman's sign reflects the ridiculous notion that 99% of the country is behind them. We are not! The middle class used to be too big to fail. But you are not the middle class. You are leeches. Middle Class used to mean that you worked hard for a living, and took care of your own business. But these people never want to have to pay for their own rent or food. Poverty used to cause hard work. Now it causes loud, obnoxious protests with colorful balloons. These leftists with the signs remind me of the folks who displayed their self-pity on the internet, apologizing to the world for the last Bush presidential victory: "Sorry world! We are good little hippies and voted against the evil Bush! Sorry we failed you!" It was pathetic. As is this. I beg to differ. 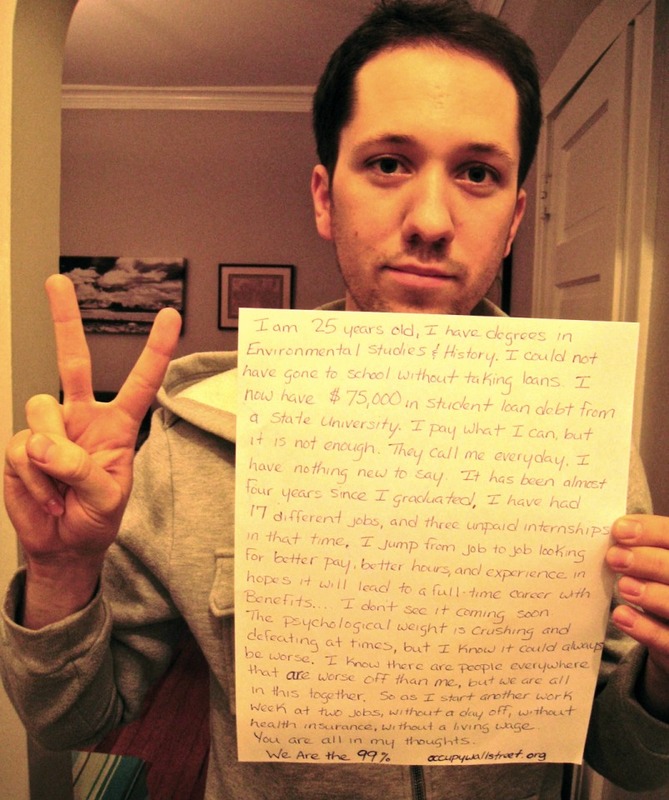 He could have gotten through school without student loans. He could have worked his way through school, as folks used to do all the time. In his semi-autobiographical book Black Boy (1945) Richard Wright tells of the old school attitude towards poverty and want. He and his family would not take help from others. It was a matter of pride, to provide for themselves through their labor. Now, many of us have grown soft, weak, and have a mindset of complete dependency on others. We are a bunch of namby-pamby wimps, whining for the government to take care of us, and protesting and rioting when others succeed in creating wealth for themselves. "... to organize, communicate, and raise awareness in the face of state attempts at repression and internet censorship." We have little of either of those in this country, in case you hippies have not noticed. The fields (of potential wealth creation) are "white unto harvest"! Go make some money. It will make you feel better. If you've gotten yourself in a desperate financial situation, as I have, go and buy this book, and do exactly what it says. It works. 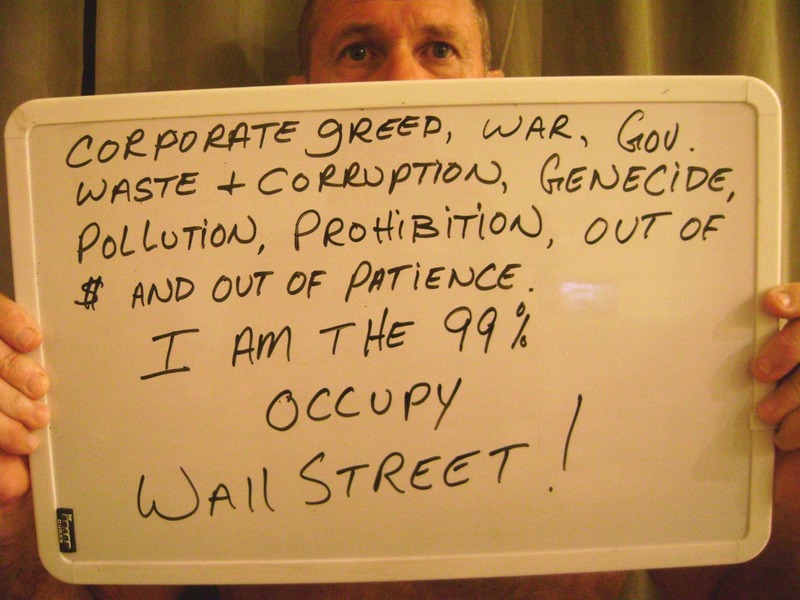 This video gives a little flavor of the Occupy Wall Street protests. The woman's sign (at around 2:00 into the video) pretty much says it all: STOP Capitalism. If I need to do a separate blog on the virtues of Capitalism, maybe I will. But it will not be stopped by a bunch of pathetic non-contributing losers and whiners like this. I imagine their numbers will dwindle once the less pleasant winter weather sets in. Honestly, I could rant for pages and pages about this. But I can't - I have to go to work!